Tulsa, Ok - Rylie Trumble (age 12), Braden Bettis (14), and LJ Grissom (16-17) joined the list of multi-time champions when they outlasted the field in their respective age groups at the 2018 NHRA Jr. 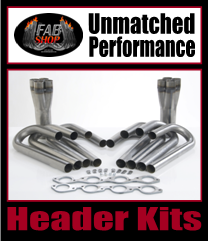 Drag Racing Western Conference Finals presented by Fairlife YUP!, one of two national events in the NHRA Summit Racing Jr. Drag Racing League. Tulsa, OK - Dale Hulquist, Crosby, Texas, and Slate Cummings, Hammons, La., had a close race in the Stock Eliminator class. Both drivers were quick off the line but Hulquist took the win with a run of 11.102 seconds, 118.43 mph. 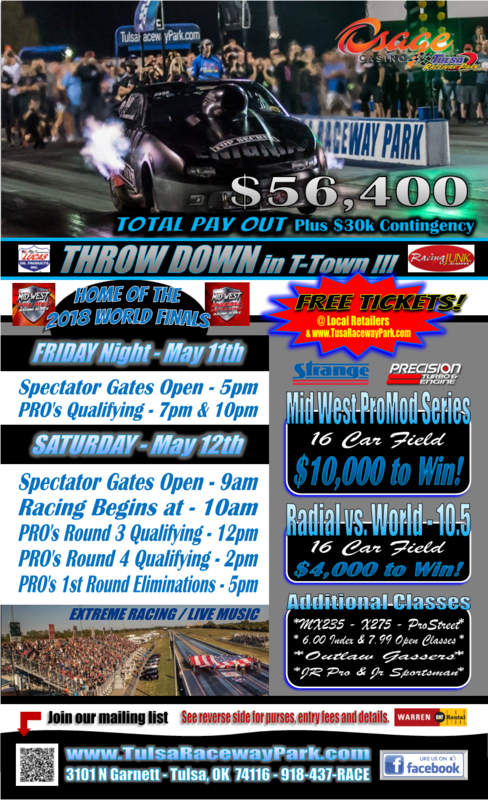 Tulsa, OK - Throw Down of 2018 will be held at Osage Casino Tulsa Raceway Park on May 11th-12th and will feature some of the top racers in the United States competing in 10 classes. It's a FREE event for the customer, and we had 25,000 fans in the stands for the weekend in May 2017. Tulsa, OK - Local standout Rodgers out of McAlester yielded a perfect light to Ross Laris, Raceland, La., but was able to recover and finished closer to her dial to take home the Wally trophy in the SDPC Raceshop Top Dragster final round. Tulsa, OK - NHRA Summit Racing Jr. 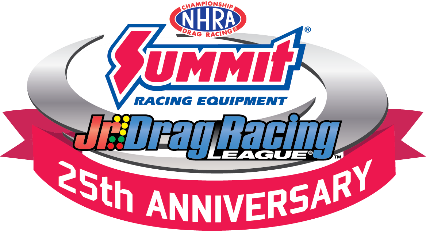 Drag Racing League racers from across the United States, ages 6 to 17 years, will compete for team and individual honors and a share of the event purse. Glendora, CA - NHRA announced that the 2017 NHRA Jr. Drag Racing Western Conference Finals and Eastern Conference Finals will be held at Osage Tulsa Raceway Park in Tulsa, Okla., and Bristol Dragway in Tennessee, respectively. Tulsa, OK - The other drivers visiting the winner’s circle were former NHRA Lucas Oil world champion Jonathan Womack, Houston, Texas, in Super Stock; Dean Oliver, Stuttgart, Ark., in Stock Eliminator; Travis Salter, Baytown, Texas, in Super Gas; Doug Woody, Independence, Mo., in the Sunset Performance Top Sportsman; and Aaron Stanfield, Bossier City, La., in KPE Top Dragster. Tulsa, OK - Todd Martin and Keith Haney would like to invite all racers to the May 2016 Osage Casino Tulsa Raceway Park Throw Down In T-Town we promise you haven't raced a race like this we have a blast plus it's a race ran by racers! 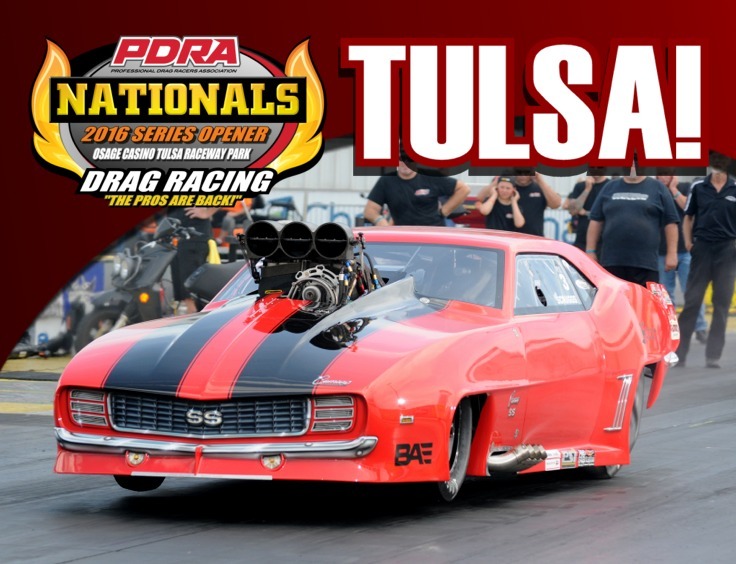 Pittsboro, NC - After a one year hiatus from the schedule, the PDRA returns to famed Tulsa Raceway Park (TRP), March 10-12 bringing professional heads up eighth mile drag racing back to Tulsa fans.